There comes a time in even the most one-eyed fan’s existence when he has to admit that his team just came up against an opponent so vastly superior in every aspect that there is nothing to do but splutter incoherently. This was one such occasion, and the world’s best side was blown away by the world’s best bowler. Correction – the world’s no. 1 side, and there’s a big difference. I’ll keep this short, and there’ll be time for a more comprehensive review after Feb 18, but this was one demolition job there was no disgrace in being subjected to. Sure, Dravid and Laxman weren’t there, but how can you argue against the greatest display of fast bowling ever seen in India, on par with Macko’s revenge mission 26 years ago? It’s a special treat to watch a team of South Africa’s calibre, and as for their spearhead, Virender Sehwag says it better than anyone can, when he calls Steyn the best bowler he has ever faced. And he has faced Murali, Warne, Akram and McGrath. It’s futile trying to analyse this performance, because Steyn was so joyously magnificent and so utterly unplayable that there’s no shame or blame in being upended by him. So, all I will do is raise a couple of points already raised by bloggers on this site. First, the Indian selection was timid – going with Saha instead of Mithun was a declaration that adding 10-15 runs was better than blooding a promising fast bowler – a remarkably self-defeating and defensive mindset. Of course, as Kumar says, going in with 7 batsmen in the squad, especially with one of them being injured in the first place, was reckless. Second is a very astute point brought forth by the Tooting Trumpet – if Kevin Pietersen had played the shot Tendulkar did in the second innings, wouldn’t he have been pilloried? He’s absolutely right, and the way India lurches between extremes in evaluating Tendulkar (witness the boos directed at him at the Wankhede in 2006) is ridiculous. Of course it’s silly to blame a batsman who has scored a hundred when his teammates fell like nine pins, but Tendulkar should have known better, and I suspect this will be among the most hollow of his 46 hundreds. And the same indictment goes for Sehwag in the first innings as well. I previewed this series with an analysis of each team’s batting and bowling, and if you do a sum-of-parts evaluation of my analysis, as they say in the investment business, South Africa comes out on top. But I plumped for a 1-0 win for India, because I was too myopic to envisage India losing at home. Sometimes the whole is bigger than the sum, but in this South African team’s case, their collective brilliance fully reflects the individual skills of their players. It is a privilege to watch these players in action, and even as a partisan, while I hope for an Indian win in Kolkata, I do know that no result will change the fact the India are currently hosting the best team on the planet. Thanks Rajesh, as usual, an interesting read and you spared the readers from me waxing lyrical about Ricky and the Rollers! If I may add one thing though, I think Hashim Amla and Jacques Kallis deserve a mention too. Their partnership was classic Test match stuff. Not once in nearly two days batting did Amla hit a ball in the air. That is remarkable discipline and concentration. Smith also deserves credit for his declaration. It proved almost perfect! Saying that I doubt there will be any declarations in Kolkata and if Amla digs in like he did at Nagpur India could be spending even longer in the field. On South Africa generally, they appear similar in form to when they beat Australia in Perth and Melbourne last year. Also, I think that after winning The Ashes and drawing in South Africa, England’s fifth Test ranking is as arguable as India’s number one spot. Oh, Amla and Kallis absolutely deserve credit! This is especially reinforced for me after watching Dhoni and others continually pad Harris away. Its amazing to see how well Amla, in particular, played Mishra and Harbhajan when they bowled in the rough outside leg stump. Throughly deserved his MoM award. Tendulkar had been playing that shot even before reaching his hundred. So thinking that he just threw it away after his hundred is somewhat overreaching the facts. on Steyn, though I fully agree, what a spell! Well, picking Saha was the only choice left after Rohit Sharma was injured. Mithun never really had a chance of making it to the team, unless he set the BP-XI game on fire (which he didn’t). For one, Tyagi was ahead in line. In fact, there is no way that India would have played five bowlers in the absence of Dravid and Laxman, so its hard to find fault with the team management for that. You could certainly heap opprobrium on the selectors for picking four seamers and only six batsmen. I’m perplexed by the team selection for the second test as well. Suresh Raina, really? Ahead of Kaif, Pujara, Kohli? If they wanted lefties, what’s wrong with Shikhar Dhawan or Parthiv Patel (check his Ranji 2009 stats before you snigger). Hard to argue with DK’s pick though, despite all the Tamilnadu talk that’s going to tumble out. Thanks Nesta. I didn’t want to do a full review, just touch on a couple of points, but yea, Kallis and Amla were immovable. But I think that the Indian batsmen would have bedded themselves in as well, considering the placid nature of the pitch, if not for the truly extraordinary bowling of Steyn in particular – that was the absolute game changer. About Tendulkar, that shot is always fraught with risk – just because it came off before he was on 100 doesn’t mean the risk had lessened. It’s just not a very percentage shot to play, under the circumstances. And he should have known that. The so-called best team on the planet had to prepare a green-top to nullify the innings defeat they’d suffered two tests ago. It also lost at home to Australia. The number one side’s recent record against the said two teams? Won 5, Lost 2, Drawn 6. The so-called best team’s record against the same opposition? Won 6, Lost 5, Drawn 3. South Africa caught the Indian team in the midst of a mini injury crisis. We’ll see what the second test has in store. I bet if South Africa lose the cynics will say the BCCI got the curator to prepare a dustbowl. This is subjective, but I say SAF are the best based on a simple test – which team am I most afraid to face? My answer is South Africa. I don’t think a turning dustbowl would be a great deal better, because Harbhajan is bowling his worst. Mishra was largely unlucky, but he too needs to make more happen while he’s bowling. 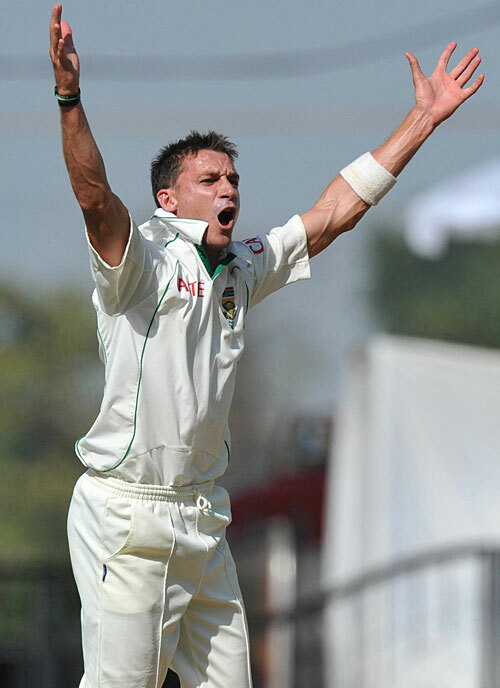 Dale Steyn is an unstoppable force, come to take your daughters and babies and kill batsmen. Good one, RK, though I must disagree slightly on a couple of points. Not taking any thing away from Steyn’s magnificience, and the epic partnership between Amla and Kallis, I agree with Mahek that SA caught India in the middle of an injury crisis.Dhoni’s team started off the test feeling a little vulnerable, and the selection fiasco exacerbated it more. Are we really hosting the best team on the planet? The same team, under home conditions, was in danger of losing a proper, full, test series against fifth placed England- and they drew the series because of the green top gamble for the final test. (Similar to what India is expected to do at Kolkata). Again, the same team lost a home series against an Australian side which had relative green horns in the test attack. What I am comfortable saying is that at Nagpur, SA played a perfect test match – did everything right-and outclassed India completely.If they can maintain this form for the next 10-15 tests (consecutive wins), I will then accept that they are the best team on the planet. Do rankings matter? Yes, to the extent they indicate the trend, and the consistency of a team.It is similar to the rankings for the best batsman in tests and ODIs.Dhoni was no.1 ODI batsman in the world for quite some time, and now its Mike Hussey. Do we all accept that they (Dhoni and Hussey) are the best ODI batsmen in the world ? I find it quite revealing that there were no arguments about the ranking algorithm when SA or Aus were exchanging the No.1 ranking. The derision of the rankings started when India became No.1 and would now die down because SA is No.1. And is Eng really at No.5? They beat the best teams both home and away, but they can also play ordinarily against say a WI team or a Sri Lankan team. They were a deserved No.2 during the Vaughan-Fletcher era, and surely had the potential to get to No.1- with the resources at their command. They now have a chance again to shoot up the rankings soon. To end my ramble on the rankings, I feel that there is no ‘best team on the planet’ at this time. After the retirement of the Oz legends, that team has ceased to be the best test team on the planet. The rankings will change between any of the top 3 or 4 teams.Unless one of these teams get into a hot streak (like how Waugh’s and Ponting’s teams did) – we will have only the rankings to look at, and the rankings are indicative of consistency. Sehwag, Gambhir, VVS, Sachin, Vijay/Karthik, Badri, Dhoni, Bhajji, Mishra, Zaheer and Sreesanth. 12th man: Vijay/Karthik. If VVS is not fit, both Vijay and Karthik will play in the XI and Raina will be the 12th Man. I would make only one change to this X! – replace Harbhajan with Irfan Pathan. (Yes, I have seen him bowl in the Duleep final at Hyderabad- he’s bowling in the 130s, and swung it nicely.Plus, his attitude has always been better than Bhajji’s. India will try to win, and SA will hope to use that approach and go for a 2-0 series win.If India lose the toss, they will find it extremely difficult to play for a win. I would have Raina in the side ahead of Vijay or Karthik. Vijay is a top order batsman and I don’t want him to bat in the middle order. Karthik’s record in the middle order is abysmal. Also, Raina provides a left-handed option that would force the South Africans to alter their lines. Mishra had the kind of test Steyn had at Newlands earlier this year. He bowled just as well there as he did at Nagpur and kept beating the edge of Collingwood’s bat. He got his reward this game. Hopefully Mishra will not be as unlucky as he was at Nagpur. Harbhajan needs to go. For good. It’s hard to identify a best team in the world just now, because all teams have rather obvious flaws. This SA team have the best new ball spearhead and, in Steyn, a quick who can move the ball in the air consistently – perhaps the only one in world cricket now Bond has retired and MJ doesn’t know where it’s going. Morkel is a bang it in merchant, an Afrikanner Flintoff, who can be an enforcer, but needs wickets at the other end. Kallis is a very good bowler, but if he’s delivering more than 10 overs in a day, something has gone wrong for SA. I thought India would win 1-0, because I thought there would be easy runs against the old ball and that the Indian spinners would take SA wickets. Play seven batsman who can score Test hundreds and two pacemen with a new ball threat and two spinners with an old ball threat and India can level the series no matter what the pitch looks like – but hit Harris hard early and knock Morkel off his length in his second spell. 1. Yes, India is (was) the no.1. team. Not the best team. The idea of the best team in the world, an all conquering force that demolishes everything that comes its way, is not a regular feature in modern cricket. It’s just that of the three such ‘best team’s, two viz. West Indies and Australia, came in one after the other. It’s not natural. India’s no. 1 spot is well earned, and India certainly is not the ‘best’ like the WI and Australia squads and of course Bradman’s invincibles. It is indeed one of the best teams though. 2. As for Tendulkar, he is a master of the sweep shot, and in such a scenario with the ball coming in from the rough from a left armer, that’s the shot he plays. After being turned a strokeless wonder against Ashley Giles’ wheelie bin bowling, that’s the shot that Sachin re-taught himself to get over that problem. And it has consistently given him runs. The dismissal, if you check, is a freak one. Rank, sheer unlucky. Sachin, indeed, was playing with the most discretion possible. Remember his face and body language after the wicket? Look, he has to play a few shots, right? The difference with KP is that KP gives chances. Sachin did not, it was a very controlled innings. The dismissal was a freak incident to conclude an otherwise extremely controlled innings. 3. And therein we come to Sehwag. Sehwag, unfortunately for all, can play in only one way. And what a wonderful way it is! And so does KP. 4. Your appreciation of Steyn is well founded. The chief batsmen i.e. Sachin, Sehwag, to an extent Dhoni did play him well though… Apart from Gambhir, but it’s just the law of averages for him. GG’ll be back. 5. South Africa can become the next ‘best’ cricketing nation, if Imran Tahir is as good as they say he is. A little comment on the Tendulkar dismissal. Due to work, it was about the only ball I saw and, with just the scorecard and the batters in mind, I thought, there’s Dhoni – too impetuous. I was amazed when I saw that it was Tendulkar who essayed the shot. I’m all for going after Harris as he is rubbish, but in that situation, the percentages had to be played. had Tendulkar matched Kallis’ score and Dhoni chipped in with 80 and the tail made the scores they did, India would have set an awkward 150 for the Kings of the Choke to chase. After making a ton, isn’t the advice to retake a guard and start again? Would he have played that shot on 0? The problem with sweeping to the left-armer bowling over the wicket into fourth day rough is that the freak dismissal is always on. Hammer Harris in the first innings, then kick away anything that isn’t a long hop or half volley in the second. I think I am with you on this, Toots. But more than vilifying Sachin, I would give the credit to Harris. If one looks at his figures before Bhajji and Zaheer tonked him for a few, he’d managed to choke the Indian batsmen completely. They could not score more than 40-50 runs from his 30+ overs. Sachin did try and score off the sweep earlier, but as you said, the percentages were 50:50, as the rough area got slowly enlarged. He must have relaxed a bit to try that shot immediately after reaching a 100, and paid for it.Harris deserves the credit for inducing such desperation. Nkumar – You’re right of course. I just can’t bring myself to give Harris any credit, but I should look in the scorebook! It was bewilderingly mechanical stuff. Know what, Tooting trumpet? I think Sachin would’ve. Played the shot even if on 0, that is. After the Hussain-planned and Giles-executed leg-theory, Sachin had hardly ever got out that way against left armers. Maybe once with Panesar, but that’s that. He had, as I said, re-taught himself the shot so that it does not remain a 50-50 shot anymore. And he has been extremely successful with that plan in the last few years. It was a freak dismissal, I maintain. Super accuracy from Harris of course, credit where it’s due. But it had been an extremely composed innings from Sachin, ended by one stroke of bad luck. And who’s to say the padding up method would have worked? Didn’t for Dhoni in the first, another freak dismissal. Is it me or have batsmen forgotten the merits of reaching the pitch of the ball? Gone are the days when Tendulkar and Laxman would come down the wicket and smother the spin. English batsmen haven’t forgotten – because they never knew! Michael Clarke uses his feet to smother the spin as often as he is able. He is a delight to watch against the slower bowlers. Sachin himself would definitely not be happy about how his wicket fell, and the futility of his century, because he fell at that juncture. Take that unfortunate ending away, it was a classy innings, for he negotiated Steyn &Co very well in the 2nd innings.20 years and counting ! Well I must say, well done South Africa for proving me wrong. Well played. Glad I didn’t have any money riding on it! I’d love to know what was Dhoni’s thinking while he was batting in the second innings, it certainly wasn’t anything to do with a counter attack. All that this match proved was that the Indian team lacks bench strength. Though that is no excuse given that teams like Australia have beaten us recently even with their B team. The thing about the Tendulkar shot is that no one questions his judgement and character, and he has been exemplary in both for 20 odd years. Whereas KP has a few sheep loose in the top paddock. And he refuses to round them up. So no one gives him the benefit of the doubt. Rajesh I don’t think you were myopic to predict 1-0 to India. Ambitious perhaps, but no one could have predicted Steyn to do this. Why no one could have predicted what Steyn did? Didn’t he demolished a full strength Indian batting line up in one of the tests on his last tour to India. He caused quite a bit of problems through out the last test series for Indian batting line up. Yes, agree with all that, but unless I’m mistaken India lost their last 6 wickets for about 20 runs. No matter how good the bowling, you wouldn’t predict that. Steyn has his off games too, he doesn’t do it all the time. Australia, who’s not the Number 1 team, beat SA in SA recently. Steyn didn’t demolish Australia. Not saying he isn’t great, just that such performances are not predictable. Fred last time when SA visited India they shot out India for just 76 in one of the test match because of Steyn heroics. Every team has their own strength and weakness due to which the match up problems are different between different sides. India will struggle against teams which have good batting depth because their bowling is weak. I don’t think they lost the match because of their batting it was their bowling which gave away too many runs. Australia and South Africa are more balanced right now. Every bowler goes through a rough patch once in a while Steyn has been #1 in ICC rankings for a while now. Wasim, I don’t think we really disagree. Didn’t lose because of their batting? Well, that’s a hard question, did they lose because they conceded almost 600 runs to SA, or because they lost 6/20 themselves? Neither was fatal, but combined, they were. It’s true team makeup and balance is so complex its hard to say who is the best team, it depends on who they’re playing, and where. I think India is facing some issues , and better bring on that young talent pretty quick. I think the strategy to play four bowlers is hurting them especially when they don’t have a genuine all rounder in the team.